I recently discovered a place called Pizza Pie Cafe. It is amazing to say the least. They have a whole slew of pizzas of all different varieties that are just delicious. However, it is there dessert pizzas that have me going back again and again. My mom came up recently to visit and to go out to lunch. She had never been to Pizza Pie Cafe so we decided she HAD to try it out. She instantly fell in love and started gushing about how delicious the dessert pizzas were. We decided we were going to attempt to recreate these amazing pizzas! If you haven’t been to this restaurant, you need to check it out at least once and sample there dessert pizza buffet. Two of our favorites were the Oreo and the Cookie Dough dessert pizzas. Ours tasted a little different than the originals, but they were still DELICIOUS! 1. Mix warm water and yeast, let sit 5 minutes. 2. Add 2 ½ cups flour and mix well in Kitchen Aid or with a dough hook. 3. Add additional 2 ½ cups flour and salt, knead. Let dough rest in a ball for 10 to 20 minutes. 7. Divide dough in half. This recipe is good for two pizzas. I made one Oreo and one cookie dough but you could do two of the same instead. Just double the ingredients listed under each dessert pizza’s ingredients if you choose to do that. 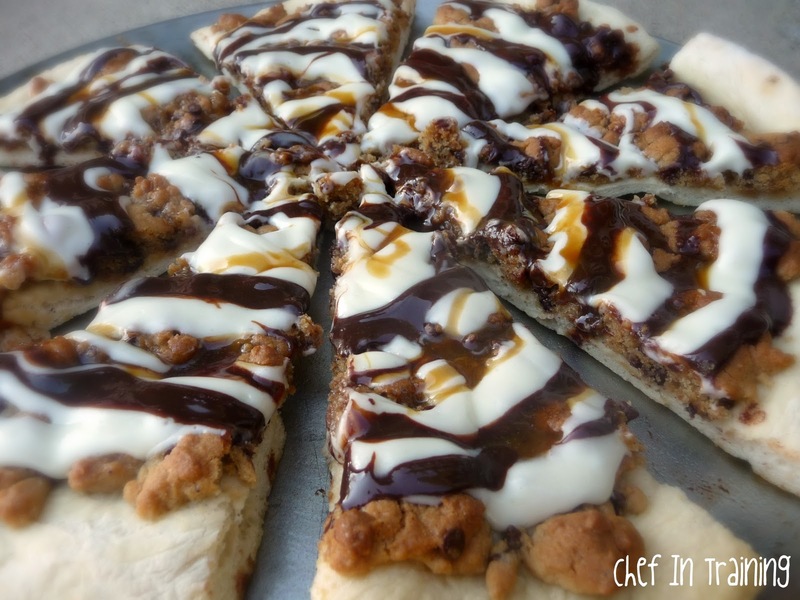 First up, I will show you the Cookie Dough Pizza. Add dry ingredients and mix together. You want it to be a little thicker than your typical cookie dough so add more flour if needed. Mix in mini semi-sweet chocolate chips. Crumble on top of second pizza dough. Cream butter and cream cheese together. Beat in powdered sugar. Blend in vanilla and salt. Add in heavy cream and beat until well combined. Adjust Heavy cream and powdered sugar to get glaze to your desired consistency. Crush Oreo’s finely in a food processor. Smear a layer of butter over top the pizza dough. Oh. My. Gosh.I'm glad I already ate breakfast :)This look incredible. How delicious! The Oreo dessert pizza must be amazing. So pretty too. The proper of making pizza is to prepare all things that need put and to mix it. This will take as more delicious as you make it. This could be amazing when it all finished. And it was perfectly great when it stated all the preparations for pizza. Oh my! This looks amazing! I'm a new follower! I'd love for you to follow me back, but no pressure :-) Have a great day! These both look absolutely amazing!!! Delicious! Oh, my! Love the pizza cookie ideas! Happy Friday! Oh ... oh ... wow. That looks so ridiculously GOOD! Oh! My! Those look deadly...I'm mean yummy! Hey thanks for linking up all your tasty recipes to Show & Share!! We appreciate you partying with us!! WOW! This is calorie-free right?! It looks scrumptious! I was looking throughout the entries on tt&j and the picture caught my eye! This looks wonderful. I am a total cookie dough addict. I really like your blog, going to go check out some of your other posts now, ttyl! Pizza Pie Cafe uses sour-dough pizza crust. That's probably why yours wasn't exactly the same. Still looks and sound yummy though. I like how much sauce you use!!! Becky, I am so sorry it took me so long to get back to you! I hope it turned out. It was a typo on my end and I forgot to add the cream cheese into the recipe. I apologize for any incontinence that caused you and hope it still turned out okay. Thanks for bringing that to my attention. I appreciate so much that you have mastered a cookie dough pizza recipe! I cant wait to try it! made the oreo cookie one for New Years Eve and it was delicious!!! Everybody loved it. thanks! I was browsing your site for some new recipes and came across this and I had to comment, because I actually worked at Pizza Pie Cafe in Provo for 4 years in college! So you were really close to the actual recipe, I'm impressed! The main difference is that they actually use a cream cheese frosting as the base on the dessert pizzas. You smother a good amount of cream cheese frosting on the crust first (like you would your pizza sauce), then you add your cookie dough or Oreos and bake, then the toppings. 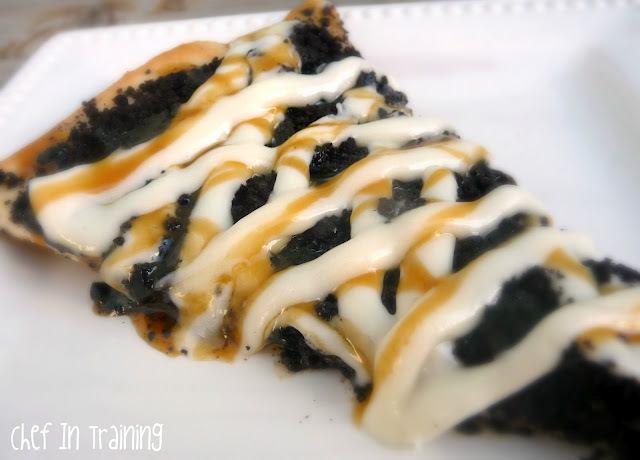 One of our favorites was to make a cookie dough pizza then put the Oreo crumbles on top of that and bake. It is amazing! Another fun one is to use a rasberry filling, something similar to a donut filling, smother that on the pizza crust then put peanut butter cookie dough crumbles on top and bake, PB&J pizza! So yummy! Great post! It said that the recipe calls for 1 tbs sugar, but then never explains when and where to the sugar in the recipe? I'm assuming the sugar is supposed to go in with the yeast but can someone clarify?